Brian Burke, President and General Manager of the Toronto Maple Leafs, announced Thursday that the hockey club has signed restricted free agent goaltender James Reimer to a three-year contract. 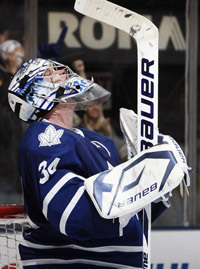 Reimer, 23, made his first career NHL start and earned the win by making 32 saves on 33 shots at Ottawa on January 1. He won four straight road games from January 1 to 11, stopping 143 of 151 shots in that span. Overall, he played 37 games for the Maple Leafs compiling a record of 20-10-5 with a 2.60 goals against average, a .921 save percentage and three shutouts. The netminder ranked first among Leafs goaltenders in games played, wins, goals against average, save percentage and shutouts. Among NHL rookie goaltenders he placed second in save percentage, fourth in wins and sixth in goals against average. He was recalled four times from the Marlies in 2010-11 and he made his NHL debut in the third period and stopped all four shots December 20 versus Atlanta. He registered his first NHL shutout with 27 saves on February 3 against Carolina. He managed a win in a season-high five consecutive road games from February 8 to March 3. His strong play in March earned him the NHL’s Rookie of the Month Award with a 9-4-1 record, one shutout, a 2.87 goals against average and a .913 save percentage. The goaltender fashioned a record of 11-3-4 when making 30 or more saves in a game this past season. Internationally, Reimer was selected to play for Team Canada at the 2011 IIHF World Championship in Slovakia where he was unbeaten in four games. He compiled a record of 3-0-0 with a 2.04 goals against average and a .920 save percentage. Reimer is a former East Coast Hockey League playoffs MVP after appearing in eight playoff games for the Kelly Cup-winning South Carolina Stingrays in 2009. The 6-2, 220-pound native of Morweena, Manitoba was originally the Leafs’ third choice, 99th overall, in the 2006 NHL Entry Draft and signed his first contract with the Maple Leafs on March 19, 2008.